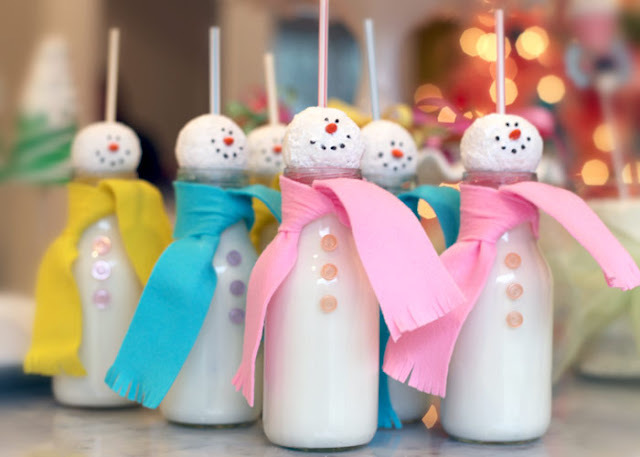 These fantastic & frosty milk bottles from Better Homes & Gardens are the perfect little treat to get you right into that fa la la spirit as you trim the tree this weekend. 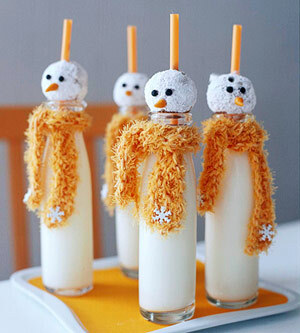 And with the promise of flurries & fun in the days ahead, I thought it would be the perfect time to send a few more snowmen ideas your way too. And I found so much inspiration out there for you to feast your festive eyes on, that I am afraid I will have to split this into two separate posts. I mean, I can't overwhelm you this early in the season, can I? 1.) 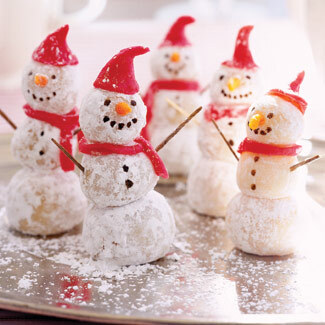 Outfit powdered doughnut holes with eyes and a nose made of edible food clay. 2.) Pierce a hole through the center of the doughnut using a skewer and fit in a straw. 3.) To add a top hat to a shorter snowman, stick a small piece of a pretzel or potato stick through a Haviland Thin Mint and into a Reese's peanut butter cup miniature, then secure the hat in place on the snowman. How sweet, right? But let's just say you don't have milk bottles OR donuts. 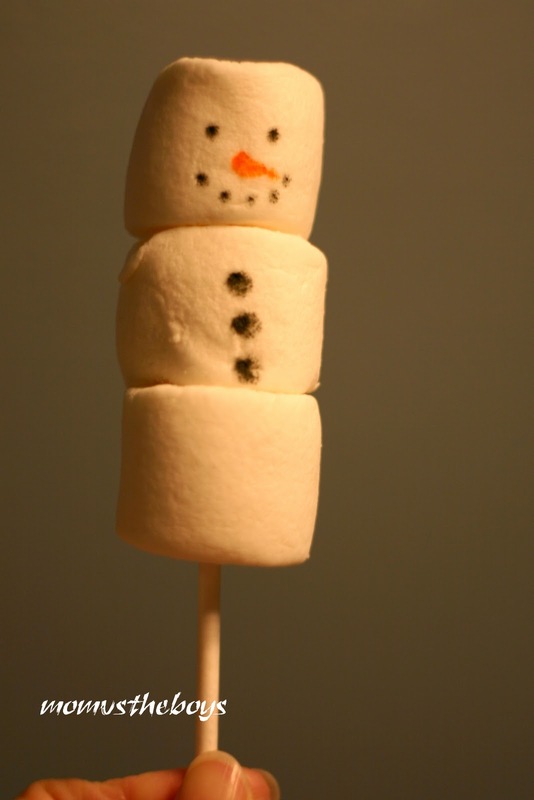 You have to have marshmallows right? Well, check out what Mom vs the Boys did with those extra marshmallows and an edible marker . 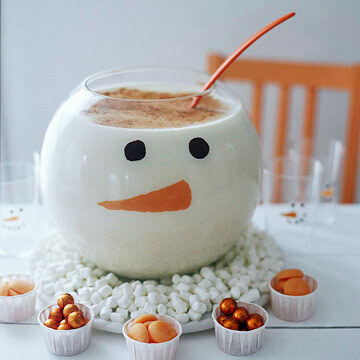 . .
~ For a temporary design, paint the inside of the glass with melted orange and black chocolate coating. Or, to use the bowl and glasses, next year, use glass paint from the crafts store to add the faces to the outside of the glass. Now those are all just plain delightful any way you look at it. 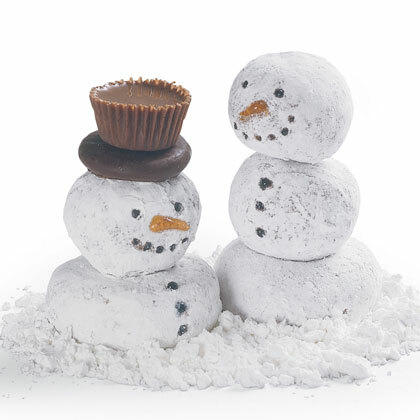 And now you'll just have to stay tuned for part two of our Snazzy Snowmen Treats, won't you? 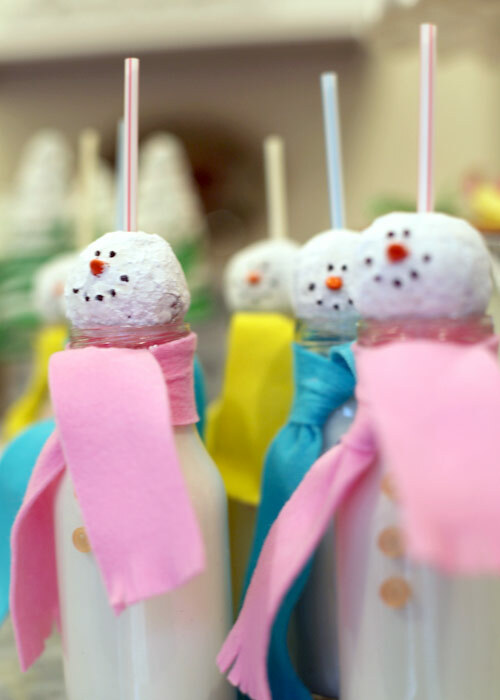 Who knew your weekend ahead was going to be filled with this much frosty fun? !